This month sees another great presentation of practical commercial magic at the Magick Lounge. 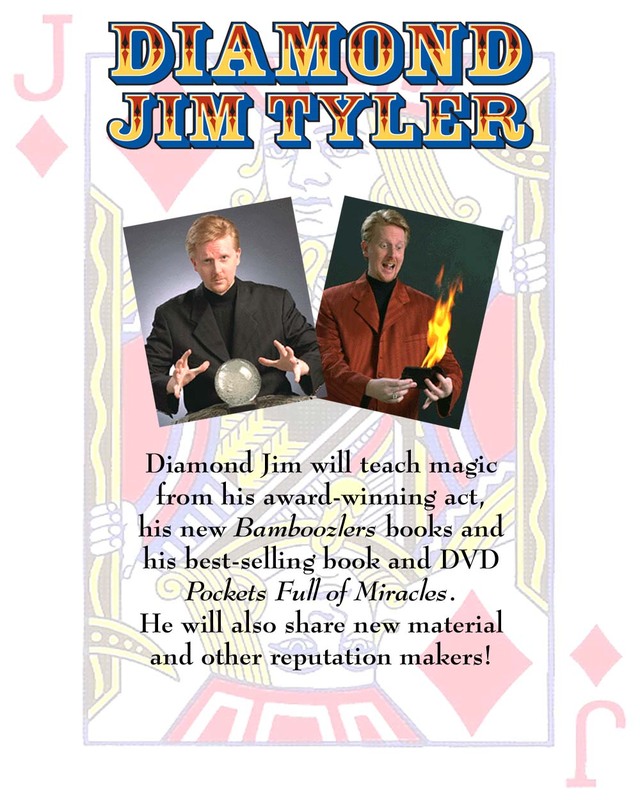 Author of Pockets Full of Miracles and the Bamboozler series, Diamond Jim Tyler is based in Dallas, Texas, but will be at the Lounge on Wednesday 11 September. Doors open at 7.02 pm and the lecture starts at 7.30. Admissions is free to SCM members and £10 to visiting magicians. Diamond Jim has toured and lectured all over the world. His book, Pockets Full of Miracles has been picked up by Dover and should be available in general book shops under the title Close-Up Magic. This will be so much more than just a lecture on cards or close-up magic. He will discuss and perform tricks with bottles, cans, mirrors, fire, coins, etc. You can expect to learn some close-up, ‘parlour’ tricks, bar bets, mentalism and more! Click here to listen to an interview with Diamond Jim. Please note that there is no Circle meeting this Thursday at the Lounge. The date has been changed to Wednesday 11 September to fit in with Diamond Jim’s busy schedule. Hi Russell, Diamond Jim Tyler is performing his lecture on Sunday 8th Sept at the High Peak Magic Society if some of your chaps cannot make the 11th. Can’t wait for this Russell.